Symphony Way Temporary Relocation Area in Delft, Cape Town, better known by its nickname Blikkiesdorp, is a relocation camp made-up of corrugated iron shacks. 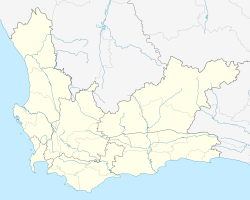 Blikkiesdorp, which is Afrikaans for "Tin Can Town", was given its name by residents because of the row-upon-row of tin-like one room structures throughout the settlement. Blikkiesdorp was built by the City of Cape Town in 2007 built in response to a court order. It contains approximately 1,600 one-room structures. According to government officials, it has cost over 30 million rand to build. The structures have walls and roofs made of thin tin and zinc sheets. They are of 18 square meters in size. Ablution, sanitation, and water facilities are shared between four structures. 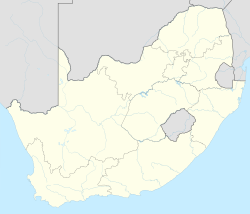 Blikkiesdorp is regarded as unsafe  and it has become well known for its high crime rate, its substandard living conditions, and its extremely hot or cold, windy and sandy living environment. Residents have been reported to be suffering from depression. It has been called an informal settlement by City of Cape Town officials despite its formal structure being built by the government. In response to the criticisms, the City has called Blikkiesdorp the safest informal settlement in Cape Town. It has also been compared to a concentration camp by residents and in national  and international media. The City of Cape Town has been criticised for its role in creating Blikkiesdorp. Premier Helen Zille and Mayor Dan Plato have come under fire from residents on many occasions. On 18 November 2009 Dan Plato was visibly harassed by residents who claimed he had lied about when they would receive better housing. NGOs, international human rights organisations, and the Anti-Eviction Campaign have publicly criticised the conditions in Blikkiesdorp and how they say it is used to reinforce the eviction of poor families especially to make way for the 2010 FIFA World Cup. Residents have also threatened to burn down Blikkiesdorp because of the bad conditions in the settlement. Ahead of the 2010 World Cup the British anti-poverty charity War on Want created a virtual model of Blikkiesdorp featuring videos of residents talking about conditions in the settlement. Blikkiesdorp has also been compared with the alien camp called District 9 from the international hit movie on numerous occasions. This even earned it a front page spread in the South African tabloid The Daily Voice. Blikkiesdorp has been instrumental in relocating residents evicted from elsewhere in the City. Many evicted residents of Salt River and Woodstock have found themselves in the relocation camp almost 30 kilometers away from town. It has been called a dumping ground for unwanted and or homeless people from all over Cape Town. The evicted Symphony Way Pavement Dwellers were moved to Blikkiesdorp in October 2009 after occupying Symphony Way for almost two years. ^ "We'd rather die than move away". Sowetan. 8 October 2009. ^ a b c "Centre on Housing Rights and Evictions ask City to reconsider Symphony Way's eviction to Blikkiesdorp". Pambazuka News. 8 October 2009. ^ a b "'Dumping ground' for unwanted people". Mail and Guardian. 9 October 2009. ^ "City gets eviction order for pavement dwellers". The Citizen. ^ "Soaring heat keeps rescuers on high alert". IOL. ^ "Life in the tin jungle of Blikkiesdorp". Archived from the original on 26 March 2010. ^ "Forced Removals". The Mercury. 29 January 2009. ^ a b Smith, David (1 April 2010). "Life in 'Tin Can Town' for the South Africans evicted ahead of World Cup". London: Guardian. ^ "City compares Blikkiesdorp to informal settlements". Anti-Eviction Campaign. 4 May 2009. ^ a b "'We don't want to live in Tin Can Town'". Sowetan. 9 November 2009. ^ "The Weekender: No temporary solution". Abahlali. 14 March 2009. ^ "UN affiliated NGO asks the City to reconsider Symphony Way's eviction to Blikkiesdorp which will be decided in Court on Wednesday". Anti-Eviction Campaign. 5 October 2009. Archived from the original on 21 November 2009. ^ "CT mayor accused of lying". Eyewitness News. 18 November 2009. ^ "Homeless S. Africans Complain Ahead Of World Cup". NPR. ^ "Delft squatters not prepared to relocate despite court ruling". SABC. ^ "Welcome to Blikkiesdorp". War on Want. ^ "Blikkiesdorp: Winner of the Audience Award for best 24min at the RUTV Doc Fest". ^ "The fire next time". SABC. 11 September 2009. ^ "Somalis harassed and threatened, but too broke to leave". Anti-Eviction Campaign. Archived from the original on 5 April 2010. Retrieved 2 April 2010. ^ "Photos: 'Blikkiesdorp', the Symphony Way TRA 18 01 2009". Anti-Eviction Campaign. Archived from the original on 24 November 2009. Retrieved 18 November 2009. ^ "Man shot by cops 'can't sit down properly'". IOL. ^ "Cape Town homeless relocated during World Cup". Play the Game.